Performance appraisal (PA), also known as employee appraisal, is the systematic evaluation of the performance and productivity of an employee on the job in relation to certain pre-established criteria and organizational objectives. It is carried out to understand the potential of the employee for further growth and development. It is a formal, structured system of measuring, evaluating job related behaviours and outcomes to discover reasons of performance and how to perform effectively in future so that both the employee and the organization get benefitted. Performance appraisal is a management tool which is used for effective utilization of the employees as well as for planning their career development and consists of regular review of employee performance within organizations. An effective PA system will have the following. It correlates with the organizational mission, objectives and value system. It covers the assessment of performance as well as potential for development. It takes care of organizational as well as individual needs. It helps in creating a clean environment by linking rewards with achievements, generating information for the growth of the employee as well as of the organization, and suggesting appropriate employee task matching and career plans. Feedback is an important component of performance appraisal. While positive feedback is easily accepted, negative feedback often meets with resistance unless it is objective, based on a credible source and given in a skillful manner. Main component of a PA system is shown in Fig.1. Performance appraisal system in an organization has the following objectives. To maintain records in order to determine compensation package, wage structure, and salary increments etc. To identify the strengths and weaknesses of employees to place right person on the right job. To maintain and assess the potential present in an employee for his growth and development. To provide a feedback to employee regarding his performance and related status. To serves as a basis for influencing the work habits of the employee. To determine the training and management development needs. . Performance appraisal involves an evaluation of actual performance against desired performance in an organization. It also helps in reviewing various factors which influence the performance of the employees. Management can plan performance development strategies in a structured manner for every employee of the organization. In doing so, management keeps the organization’s goal in mind and aims at optimal utilization of all available resources. Performance appraisal is a multistage process in which communication plays an important role. There are eight stages in the process of performance appraisal process. These stages are described below. Establishment of standards and measures – The first step is to identify and establish measures which would differentiate between successful and unsuccessful performance of an employee. These measures should be under the control of the employee being appraised. The methods for assessing performance should be decided next. Basically management wants to know through the PA system the behaviour and personal characteristics of the employee and assess his performance and achievement in the job. There are several methods which are available for assessing results, behaviour and personal characteristics of an employee. These methods can be used as per the requirements and suiting the particular circumstances. Communication of job expectations – It is the second step in the appraisal process and consists of a communication to the employee the measures and standards which are to be used in the PA process. Such communication is needed to clarify expectations and to create a feeling of involvement. Planning – In this stage, the management plans for the realization of performance expectations, arranging for the resources to be available which are required for attaining the goals set. This is an enabling role. 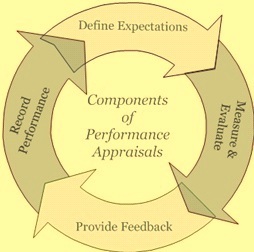 Monitoring performance – Performance appraisal is a continuous process, involving ongoing feedback. Even though performance is appraised at fixed interval usually once per annum, it has to be managed each day, all year long. Monitoring is a key part of the performance appraisal process. It should involve providing assistance as necessary and removing obstacles rather than interfering. The best way to effectively monitor is to walk around, thus creating continuous contacts, providing first-hand information, and identifying problems, which can then be solved promptly. Appraising – This stage involves documenting performance through observing, recalling, evaluating, written communication, judgment and analysis of data. This is like putting together an appraisal record. Feedback – After the formal appraisal stage, a feedback session is needed. This session involves verbal communication, listening, problem solving, negotiating, compromising, conflict resolution and reaching consensus. Decision making – On the basis of appraisal and feedback results, various decisions are made which are giving rewards (e.g., increments, promotion, and incentives etc.) and punishments if any. The outcome of an appraisal system is also used for career development. Development of performance – The last stage of performance appraisal is professional development, by providing opportunities for upgrading skills and professional interactions. This can be done by providing training, supporting participation in professional conferences or by providing opportunities for further study. Such opportunities can also act as incentives or rewards to employees. Communication is at the core of any performance appraisal system. Communication can be either upward or downward. Downward communication is from management to the employees to be appraised. This consist of usually conveying to the employee about his performance, action needed by the employee for his improvement and his training needs etc. As the information flows downward, it becomes more individualized and detailed. Upward communication is from lower to higher levels. Through this process, employee communicates his needs, aspirations and goals. As information flows upward, it has to become brief and precise because of the channels through which it has to pass. There are many approaches for performance appraisal which is a multistage process involving several activities. Some of these approaches are given below. Intuitive approach – In this approach, a supervisor judges the employee based on his perception of the employee’s behaviour. Self appraisal approach – Under this approach an employee evaluates his own performance using a common format. Group approach – In this approach, a group of senior employees evaluates the employee. Trait approach- This is the normal approach commonly followed in most of the organizations. In this approach a supervisor evaluates the employee on the basis of observable dimensions of personality such as integrity, honesty, dependability, and punctuality, etc. Appraisal based on achieved results – Under this type of approach, appraisal is based on concrete and measurable work achievements judged against fixed targets or goals set mutually by the employee and the management. Behaviourial method – This method focuses on observed behaviour and observable critical incidents. There are several techniques which are being used for the performance appraisal. Each one of them has strong points as well as limitations. Some of the commonly used techniques for the performance appraisal are essay appraisal method, graphic rating scale method, field review method, forced choice rating method, forced distribution method, critical incident appraisal method, checklist, forced choice method, management by objectives, work standard approach, 360 degree feedback, and ranking method. A performance appraisal system can be designed based on intuition, self analysis, personality traits, behaviourial methods and result based techniques. Different approaches and techniques can be blended, depending on the goals of performance appraisal in the organization and the type of review. For example, management by objectives, goal-setting and work standard methods are effective for objective coaching, counseling and motivational purposes. Critical incident appraisal is best suited when supervisor’s personal assessment and criticism are essential. A carefully developed and validated forced-choice rating can provide valuable analysis of the individual when considering possible promotion to supervisory positions. Combined graphic and essay form is simple, effective in identifying training and development needs, and facilitates other management decisions. The following are the components of performance appraisal form. The following are the positive aspects of the PA system. It promotes better understanding of an employee’s role and clarity about his functions. It gives a better understanding of personal strengths and weaknesses in relation to expected roles and functions. It identifies development needs of an employee. It establishes common ground between the employee and the supervisor. It provides an employee with the opportunity for self reflection and individual goal setting. It helps an employee internalize the culture, norms and values of the organization. This helps develop an identity with and commitment to the organization and prepares an employee for higher level positions in the hierarchy. It assists in a variety of personnel decisions. It helps the management to chalk out the methods for rewarding the efficient employees and punishing inefficient employees. It helps in chalking out compensation packages for employees. Merit rating is possible through performance appraisal. PA tries to give worth to a performance. Compensation packages which include bonus, high salary rates, extra benefits, allowances and pre requisites are dependent on performance appraisal. The systematic procedure of PA helps management to frame training policies and programs. It helps to analyze strengths and weaknesses of employees so that new jobs can be designed for efficient employees. It also helps in framing future development programs. It helps management to understand the validity and importance of the selection procedure. The management come to know the validity and thereby the strengths and weaknesses of selection procedure. Future changes in selection methods can be made in this regard. For an organization, effective communication between employees and management is very important. It serves as a motivation tool. Through evaluating performance of employees, an employee’s efficiency can be determined if the targets are achieved. This very well motivates an employee for better job and helps him to improve his performance in the future. If not done right, PA can create a negative effect on the employee’s motivation. Performance appraisals are very time consuming and can be very tiring to supervisors with many employees. They are based on human assessment and are subject to human errors and biases. PA can be a waste of time if not done appropriately. PA can create a very stressful environment for everyone involved.